I read just now in the Telegraph that Silvio Berlusconi sent escorts to Gaddafi’s rival in view of the election of 2009 African Union leader, then won by the Libyan dictator. The British newspaper cites Nuri Al Mismari - a former aide of the latter - who explains the details of the bizarre action to Arab newspaper Ashaeq Al-Awsat, in Paris. The Gaddafi’s opponent was then persuaded to step aside thanks to the Mubarak’s granddaughter’s job. Al Mismari states that the situation was resolved with an unorthodox solution. Some may rightly think: that’s anything new; we may expect everything by that man. Someone else might add: stop talk about it, he gains power if you still attack him. Someone else will also be able to argue: so what? He sent a couple of whores to a friend. Don’t leftists use these things? Puritans hypocrites! And so on, as the script suggests. Well, once and for all, let’s twist this script. I still remember like it was yesterday - and I do not know if it's a good thing – when Indro Montanelli told Enzo Biagi that Berlusconi was in brief as a virus and had to go to the government to see the antidote. In my humble opinion, in our country, to really realize the lowest level at which we went with Mr. B., we did not have to get rid of Silvio but rather try to indulge him even more. I got the impression that the antidote or antibody has not yet been developed because the virus has not yet appeared in its fullest form. That is simple: not censoring his questionable actions, but enhancing and making them, you know… official. stop the fight, lay down your arms, so it is useless. I apologize for the unpleasant image, but it's as if you tried to squeeze a pimple that is not yet mature. The only effect you get is to infect it and make it becoming increasingly cumbersome and painful. It is not yet time to pop that damn bubo and rejoicing on the swelling pus coming out hilarious as the red-hot lava from a thousands years old volcano. On the contrary, we have to put the treacherous pimple that disfigures the Italic skin in a position to grow and mature at all. It should be supported, not opposed. And when it gets results, it should be celebrated and exalted, taking as an example, especially if the ways are not legitimate. Otherwise, don’t you see what happens? The unripe spot becomes inflamed and feeling oppressed it moves forward the time of holy eruption. Let's assume, then, that the prime minister sends some escorts to a leader of another country, with the task of seducing his friend’s rival, helping him to get rid of the opponent. Imagine that it obtains the expected goal. Don’t be shocked, come on! This is just an unorthodox solution; that is an original strategic/diplomatic initiative that has been successful. Why not make it ordinary? Think about what might happen in the future. President Obama, in the next elections, could call Silvio and ask him to send a couple of hot girls to distract the competitor’s Republicans. Someone said that the latter have already done to defeat Clinton with Lewinsky, this is not science fiction. Merkel's rivals may be able to order a couple of studs to seduce her, after two big pints of beer. Well, Italy prime minister would have some difficulty in meeting the desire of the French left to find women that can make Sarkozy forget the beautiful Carla Bruni. Maybe Merkel’s studs may find his vicious secrets, isn’t it? The pints should be four, but these are details. So, instead of looking through the keyhole, why not directly break Silvio’s door? The futures that would be ahead us are two: the pimple becomes as large as to cover the entire face, to explode like a bomb or… or we patent the Bunga Bunga and we sell it abroad. 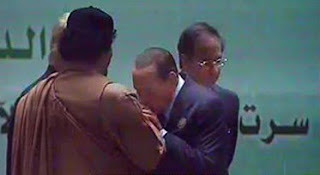 The News: Berlusconi sent escorts to Gaddafi's rival.